The NYC city plate: Designy and educational. 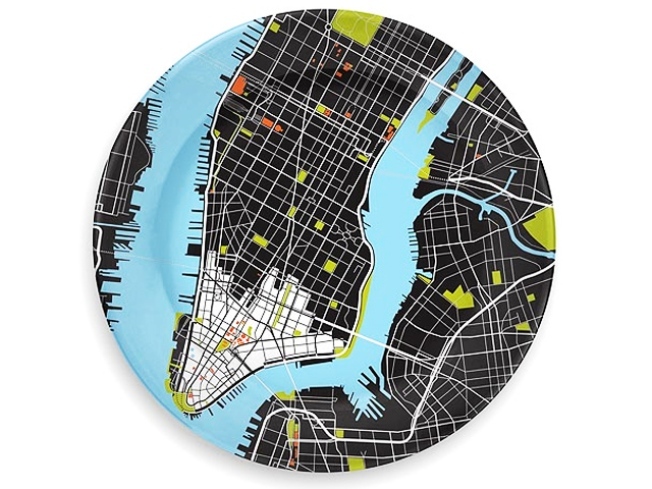 METRO: Each of these 12”-across porcelain plates represents a major city’s downtown core in starkly stylish colors – landmarks of note are flagged in red, and there’s even a key to the map tucked in with your purchase. Choose between NYC, London, Paris and Tokyo, each $48, at Annie's Blue Ribbon General Store, 365 State Street, Boerum Hill, Brooklyn; 718-522-9848. FALL IN: Wink stocks some of the most covetable labels around, so when the chainlet throws a warehouse sale, we stand at attention. Today through Saturday, get up to 80% off fall goods from Earnest Sewn, Frye, Hayden-Harnett and the like. 188 Columbus Avenue; 212-877-7727. SEATED: You have a mere week (through October 23) left to scoop up serious discounts on furniture collections from the likes of Le Corbusier, Lissoni, Starck and others as Italian home design emporium Cassina holds its fall sale. A 20%-off deal here means hundreds of dollars in savings. 155 East 56th Street; 212-245-2121.